Over the past three year, the work of the Housing Environments Research Group has revolved around Community Land Trusts (CLTs), an alternative ownership, shared equity housing model. 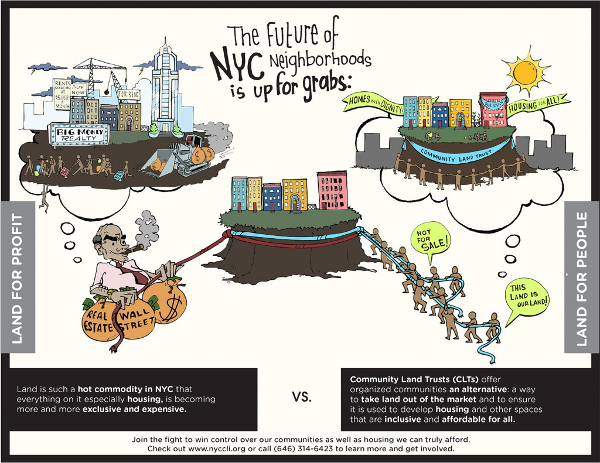 This model has been gaining attention from a small, but emerging group of scholars and policy makers, both nationally and internationally as an alternative that takes land out of the speculative housing finance sector, provides permanent stewardship of the land and housing, and collectively governs decisions, policies and practices affecting use of land and housing. In particular, CLTs are being proposed as a potentially viable avenue for affordably, stably, and sustainably housing low-to-moderate income households. HERG’s analysis of organizational/administrative and three waves of survey data of homeowners with the City of Lakes CLT , located in Minneapolis, supports and builds on these claims. From this analysis, which began in the Fall of 2012, three papers have been developed (with the aim of being completed by the end of the year) which contribute to the emerging national discussion around CLTs in important ways. In continuing this work, two team members, Kristen Hackett and Erit Maor, were recently awarded the Marilyn Gittell Summer Research Assistantship. Their efforts will be focused on analyzing and publishing on the latest round of survey data collected by CLCLT. Drawing on these findings as pilot data, HERG Director Susan Saegert has been engaged in developing and submitting funding proposals for a national study of the effects of CLT homeownership on residents’ lives. In addition to scholarly efforts, HERG has participated in the newly incorporated New York City Community Land Initiative (NYCCLI). Team member Hillary Caldwell has played a pivotal role by working with the Education and Outreach workgroup to develop popular education materials and running a study group on CLTs with Picture the Homeless members. Picture the Homeless was one of the advocacy organizations most involved in developing CLT initiatives in NYC. Saegert participates in the Policy workgroup. Both are involved in developing research to document and support the work of NYCCLI. Hillary and HERG colleague, Professor John Krinsky, are developing a robust research program for and about NYCCLI with funding from City College’s Collaborative Research for Social Impact Grant and the Center for Research on Activity and Learning (CRADLE) at the University of Helsinki. Marinova, M., Saegert, S., Hackett, K., and Dozier, D. (2014, June) Community Land Trusts: Promoting opportunities for low-income homeownership. Poster to be presented at the Biennial meeting of the Society for the Psychological Study of Social Issues, Portland, OR. Hackett, K., Saegert, S., Dozier, D., and Marinova, M. (2014, March). Community Land Trusts: So much more than housing and a new twist in our conception of the American Dream. Paper presented at the Annual meeting of the Urban Affairs Association, San Antonio. Oakley, D., Hackett, K., and Saegert, S. (March 2014). 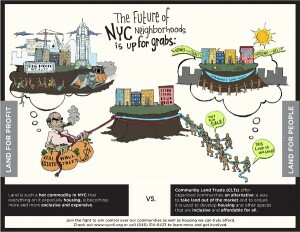 Community Land Trusts: Interrupting Inequality. Presentation for webinar hosted by the National Community Land Trust Network. City of Lakes Community Land Trust (CLCLT) is based in Minneapolis Minnesota. By the end of 2014, CLCLT assisted more than 200 household secure stable, affordable and sustainable housing. Click on the image to find out more about CLCLT. 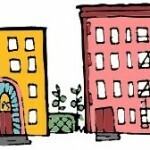 The New York City Community Land Trust Initiative (NYCCLI) is a recently incorporated CLT aiming to protect the housing rights of lower income New Yorkers. Click on the image for more information on the work of NYCCLI, and/or the larger housing issues in NYC.